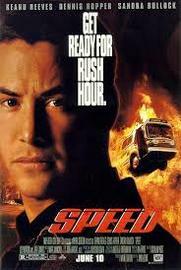 Speed is a 1994 action thriller film directed by Jan de Bont in his feature film directorial debut. The film stars Keanu Reeves, Dennis Hopper, Sandra Bullock, Joe Morton, Alan Ruck, and Jeff Daniels. It became a surprise critical and commercial success, winning two Academy Awards, for Best Sound Editing and Best Sound Mixing, at the 67th Academy Awards in early 1995. The film tells the story of an LAPD cop who tries to rescue civilians on a city bus rigged with a bomb programmed to explode if the bus slows down below 50 mph.